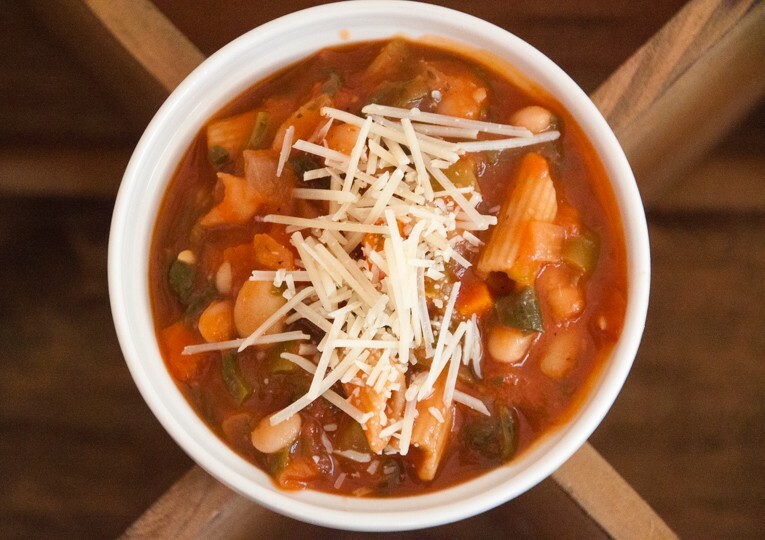 Now that fall is here, soups are back on the menu! 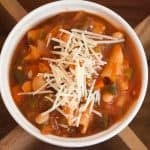 This is one of our family’s favorite soups: it’s hearty, spicy, healthy, satisfying, and has great texture: crunchy (from the veggies) and creamy (from the white beans and parmesan). It’s just all-around feel good food. 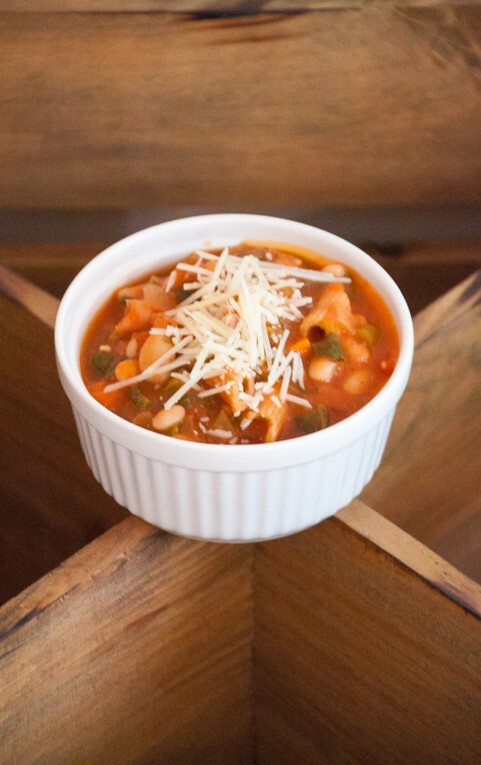 It was a nice endorsement from someone who used to live on Taco Bell and Frozen Pizzas, to say the least 🙂 Fast forward a few years later, and the husband still loves this soup – and now Layla loves it too! This recipe is great because it’s super easy to make, takes only 30 minutes, and it’s a great vehicle for “sneaking” extra veggies into your diet. 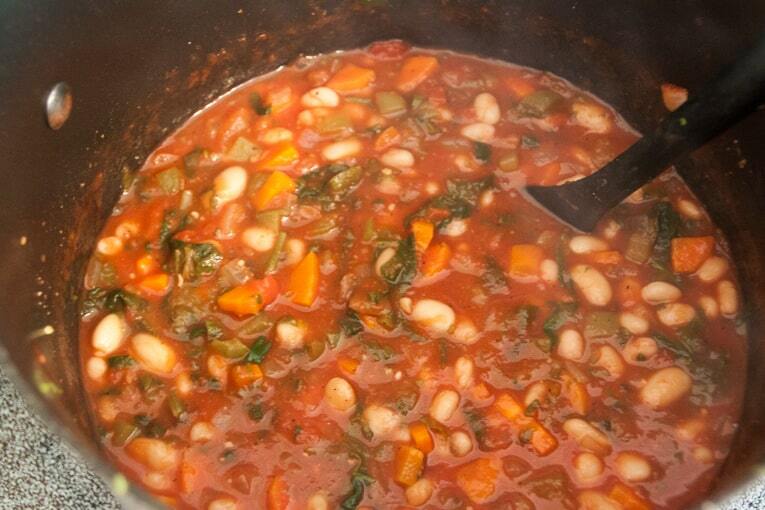 The tomato and white bean base makes it conducive to adding just about any vegetables into the soup. I chose carrots, bell peppers, kale, and red onions – but you can really use anything you’d like. I was originally inspired to create this stew by a recipe I saw on the Food Network, from Giada De Laurentiis. I made a quite a few modifications to the recipe, but the base and spice mixture is inspired by the original recipe from Giada. I topped the soup with a sprinkle of Parmesan Cheese, and served it with Alexia’s All Natural Garlic Bread. I love Alexia’s frozen products – they don’t have any weird ingredients in them, and they taste delicious. And now, on to the stew. My modified recipe is below and the original is here. Hope you enjoy it as much as we did! 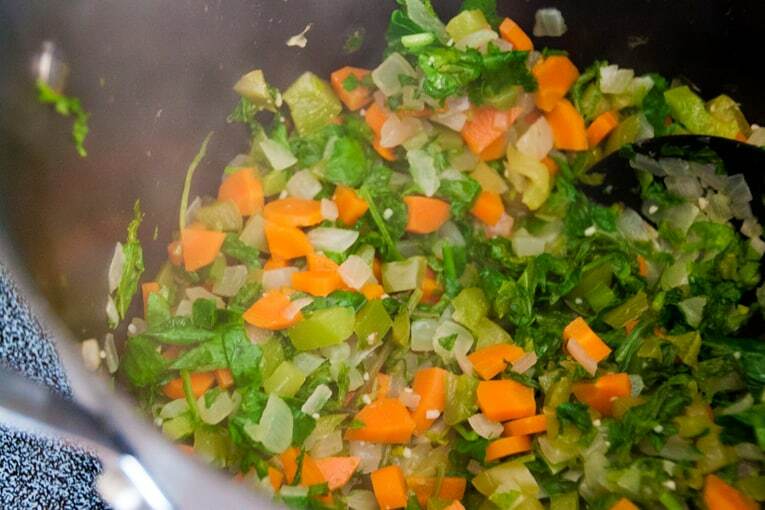 Step 1: Warm the olive oil in a large soup pot over medium heat and chop your veggies. Meanwhile, boil water for your pasta in a separate pot. Step 2: Add the carrots, peppers, onion, and garlic and saute until soft, about 5-10 minutes. Add in the kale, cook 2-3 minutes. 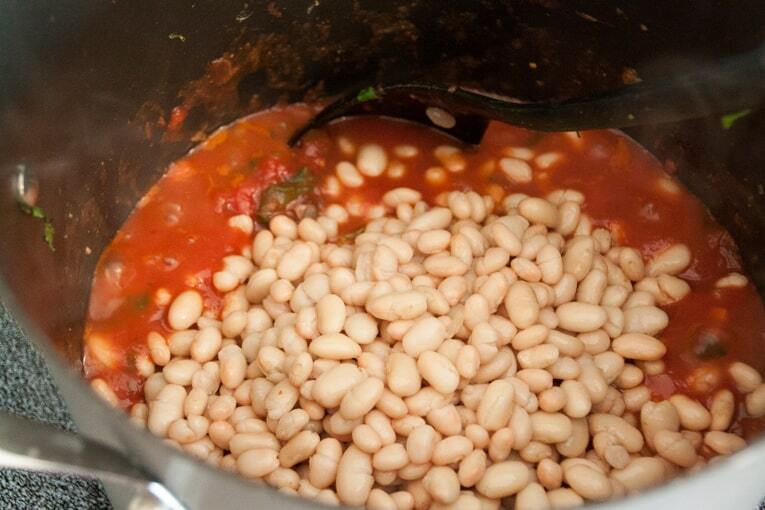 Step 3: Add the crushed tomatoes, broth, beans, and spices (red pepper flakes, salt, pepper). In the separate pot of boiling water, cook your pasta. Step 4: Simmer the stew for 20 minutes on medium-low heat. 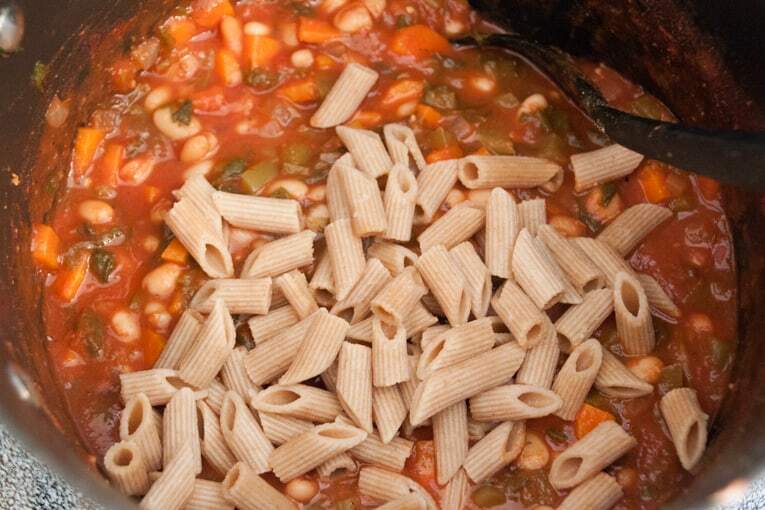 When the stew is close to done, stir in the pasta (note: I cut each penne pasta in half once it was done cooking – to make them smaller and match the size of the other ingredients in the soup). Step 6: Ladle into bowls, and top each bowl with 1 tbsp of freshly grated parmesan cheese. This is a healthy, balanced meal that even the most die-hard junk-food lovers will enjoy! 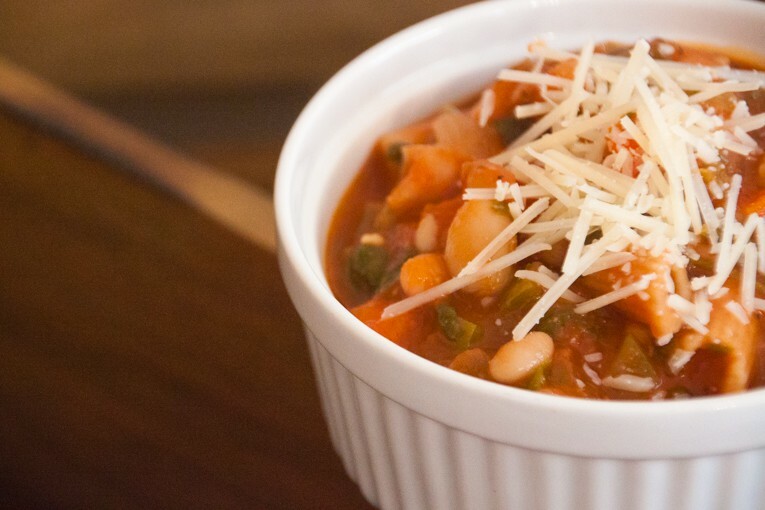 This is one of our family’s favorite soups: it’s hearty, spicy, healthy, satisfying, and has great texture: crunchy (from the veggies) and creamy (from the white beans and parmesan). It’s just all-around feel good food. Warm the olive oil in a large soup pot over medium heat and chop your veggies. Meanwhile, boil water for your pasta in a separate pot. 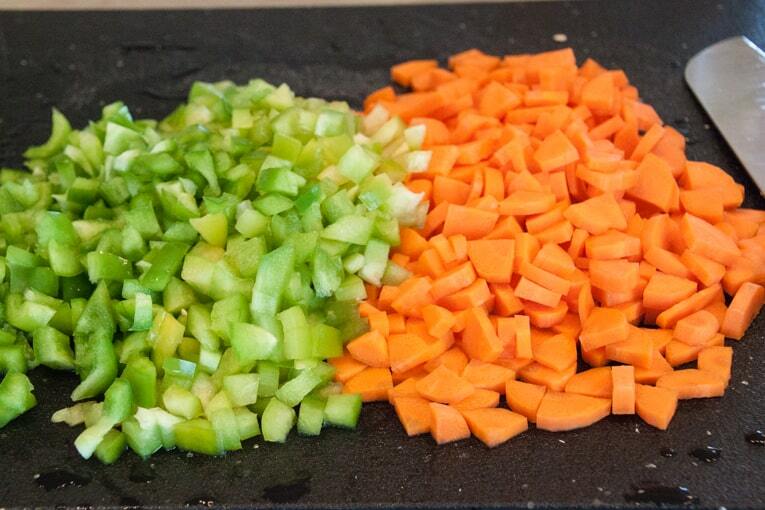 Add the carrots, peppers, onion, and garlic and saute until soft, about 5-10 minutes. Add in the kale, cook 2-3 minutes. Add the crushed tomatoes, broth, beans, and spices (red pepper flakes, salt, pepper). 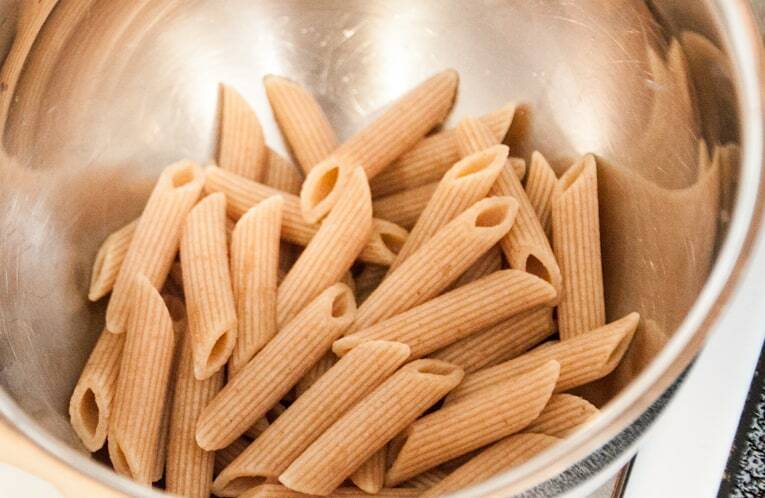 In the separate pot of boiling water, cook your pasta. Simmer the stew for 20 minutes on medium-low heat. When the stew is close to done, stir in the pasta (note: I cut each penne pasta in half once it was done cooking - to make them smaller and match the size of the other ingredients in the soup). Ladle into bowls, and top each bowl with 1 tbsp of freshly grated parmesan cheese. Thanks Roxana! I’m sure you’ll love this recipe! Wow, this looks so great! Last Sunday I threw a birthday party for my friends. I made this soup as a birthday recipe, and all of my friends were praising me for this recipe! Thank you so much for sharing. Aw thank you so much Anders! I’m so happy you and your friends enjoyed this recipe, and happy birthday! Looking forward to trying this! Is it suitable for freezing? Tried this tonight–it was absolutely delicious!! Will definitely be making it again! Really love the recipes on your blog! I like how they are healthy but also tasty and filling; nice winter alternatives to salad! Yum, definitely adding this recipe to the menu as the weather gets chilly! Yay! I know you will love this recipe Pamela! Never tried that kind of soup (it’s like a mix of 2 traditional Spanish meals), but we’ll definitely try it! Oh interesting! I had no idea it had Spanish influences – that’s cool 🙂 Hope you like this when you try it! Hey! Hmm I don’t think that adding zucchini into this recipe would make it taste like Thai food – but it depends on how you define Thai food 🙂 If that was the only change you made then try it without the zucchini next time! I plan to make this tonight 🙂 One question though: do you pre-cook the pasta beforehand or not? Thanks! Love your site! Thank you! I ended up cooking the noodles about 3/4 of the way and then added them to the soup. They were whole wheat like yours, so the longer cooking time made them softer and yummier. Loved it!! Didn’t have fresh Parmesan on me, so I used a little bit of goat cheese (and later, on another bowl, shredded cheddar/jack mix)… delightful! 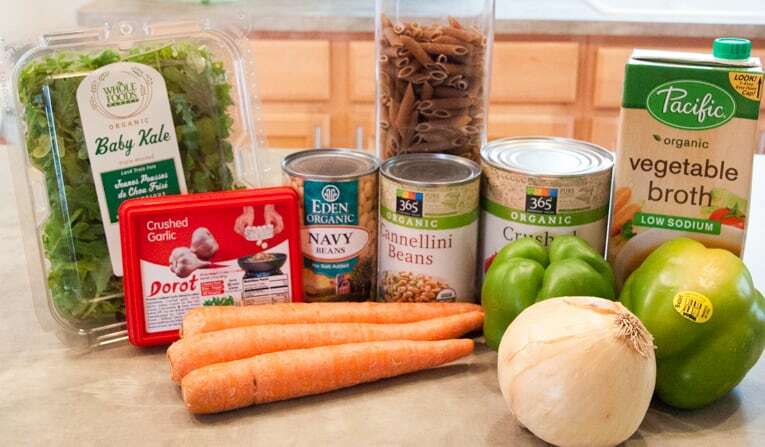 I also added another can of Great Northern beans since I had them on hand, and because I am a vegetarian too and need the protein. The only thing I did wrong was not add enough spice… I put in 1/4 tsp. red pepper flakes plus a little bit more, but didn’t taste any spice at all! :\ I do like spicy, so maybe I’m biased. Next time I will add more, or maybe use cayenne pepper instead of red pepper flakes, which tends to do the trick for me (though I am an amateur). Yay! I’m so glad it turned out well – and to your point about the spice – since you added double the amount of beans you definitely need more spice 🙂 Since beans are so starchy, they absorb all the flavor and the additional spice will help balance it out. I’m so happy you got to enjoy the leftovers too!! Hope you are having a great weekend! We made this for dinner tonight. We replaced some of the marinara with fresh tomatoes, added a jalapeno, and only used one can of broth (because my boyfriend likes his soups thick). It was really good! We will definitely be making it again. Love the modifications you made Hilari! Especially adding the jalapeno – yum!! 🙂 So glad you liked it! I’m going to try this soup this weekend. I’m sure my hubby would love it. Thanks for sharing this. Yay!! I can’t wait to hear how both of you like it! 🙂 Enjoy! Good, easy recipe and the soup looks great. Thanks Linda! Let me know if you end up trying it! Oh, I love good hearty vegetable soup in the winter. This is so colorful and pretty too. Yum! 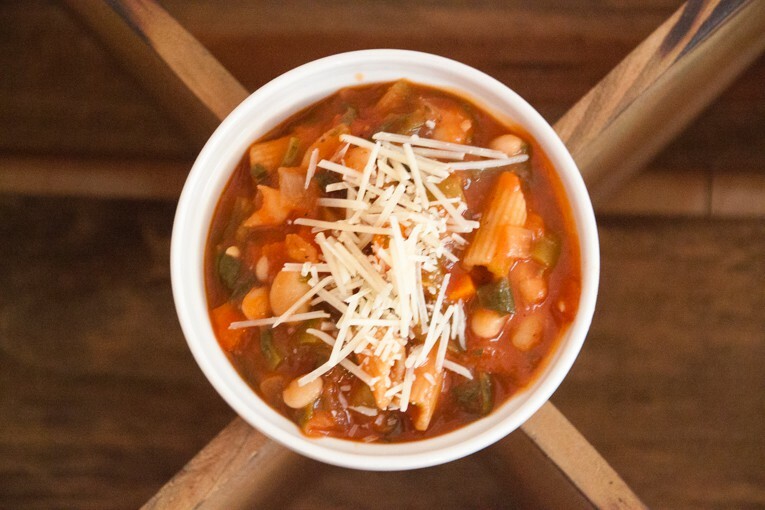 It definitely is hearty – totally warms you up from the inside out. Can’t wait to hear how you like it! That soup looks so good I can smell it. And now I’m starvin!!! It’s hard to think of hot soup when the air feels like hot soup, but your post made me reconsider. That’s a good point Carol! The husband and I always end up making soup in the summer – we just let it cool off a bit before we eat it so it’s not *too* hot 🙂 Enjoy!